In my closet, I keep a cast iron pan, a Dutch oven, a Pyrex baking dish, a spatula, and a spoon. I have easy access to a kitchen this summer, and I intend to use it. My cooking implements, which will hopefully last through the next year, cost $80—I brought my knives with me from home. Stocking my pantry was similarly simple: olive oil, apple cider vinegar, honey, brown sugar, kosher salt, black pepper, cayenne pepper, chili powder, nutmeg, cinnamon, and ancho chilies. Ironically, now that I have a kitchen there’s no fridge in sight. Perishables must be procured within a short window of opportunity. With that list of basic ingredients and a willingness to brave Westside Market’s crowded aisles, I should be able to cook most of my repertoire. At home, I exclusively use cast iron. This is a habit I acquired from my dad, who taught me to appreciate its heft and durability. I cheated though, due to time constraints and sheer laziness. I bought a Lodge cast iron pan at Williams Sonoma that came pre-seasoned. Not that seasoning is a particularly complex process. I just wanted to cook myself dinner Sunday night and needed cast iron stat. On Sundays, Morningside Heights hosts a greenmarket just outside Columbia’s gates. Samascott Orchards, Meredith’s Bread, Beth’s Farm Kitchen, and a semi-regular group of mushroomers, fishermen, and butchers line up between 114th and 115th streets. I bought young garlic at the Samascott stand, a third of a pound of yellow oyster mushrooms, and m’smen—a Moroccan bread—at Hot Bread Kitchen. Later that day, I bought a half pound salmon fillet at Westside. This so-called recipe should prove that dorm cookery can be elementary and rewarding. Begin with the young garlic—immature garlic plants that have not yet developed full bulbs. Cut off the upper leaves, saving only the nascent bulbs and the light green shoots. Peel off the tough outer skin and wash off the dirt. Chop the garlic into small, one centimeter square pieces. Wash the oyster mushrooms. Sever the thin mushroom stalks from their woody base. Pour about one tablespoon of olive oil into the cast iron pan, and heat until the oil is just smoking. Add the garlic and the mushrooms, a good scattering of salt, and a shake or two of pepper. Allow the garlic and mushrooms to caramelize, then drizzle enough apple cider vinegar over the top to moisten them. Lower the heat and cook until tender, then remove from the pan and reserve on a plate. Turn up the heat. Take your piece of m’smen and throw it on the pan. Warm it on one side, and then the other. Drape it over the mushrooms. Pour more olive oil into the pan and again heat until just smoking. Liberally salt and pepper the salmon on both sides. Cook skin side down for three minutes, or until the skin tightens. Carefully flip the fish and cook for another two minutes. The salmon will still appear quite rare, but that’s alright, assuming you like to eat fish on the cooler side. Gently perch the salmon on the m’smen. Eat however you please, preferably with a plastic fork and knife, or some utensils. 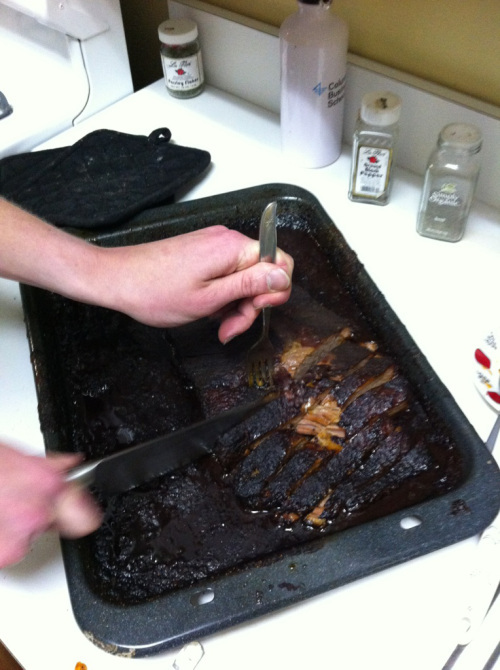 Fingers will be needed for the meal’s final moments. There is something intrinsically satisfying about cooking, whether for one or for a crowd. 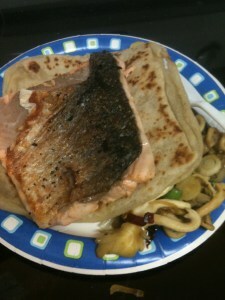 Crunching through that salmon’s (rather incredibly) crispy skin, I finally felt like a bona fide dorm chef. If you don’t mind exuding garlic for hours after eating, this dinner makes for a relaxing Sunday night supper. Apologies for the poor photo quality. I shoot with an iPhone, and am frankly not concerned with any aesthetic principles. Whatever gets me to the food the fastest. Also, you may note ancho chilies in the mushroom mix—I found their fruity, smoky heat incongruous, and so eliminated them from the recipe. Orzo Salad with Olives, Mushrooms, Raisins, and Sunflower SeedsIn "College Life"
Cooking with Cast Iron: Pasta Two WaysIn "College Life"
I watched eagerly as ladies on the street corners of Rabat prepared fresh M’smen every morning & evening. When she saw me hooked, the lady gave me an on the spot cooking lesson in making M’smen. 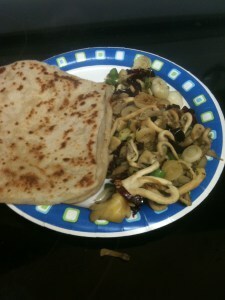 It reminded me of India, where they serve parathas (made similarly) for breakfast, served with vegetables or curry. nodepositbingo.org Money in Faster Today!Naked play bingo Online With Paypal.